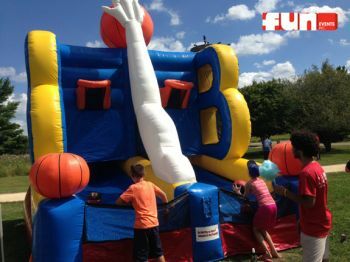 The Full Court Press interactive inflatable basketball game is an entertaining basketball challenge. Each player starts with 3 basketballs on their side of the "court". Once a player makes a basket, their ball drops into the competitions side. The first opponent to make more baskets / free throws and leave all the basketballs on the challengers side while being left with none them self WINS!